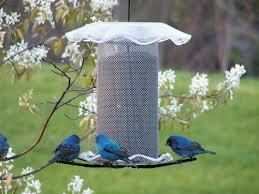 "People who feed wild birds are good people. Consider this: Have you ever known someone who goes to the trouble to put up a bird feeder in the back yard, and regularly goes out to let down the feeder, or to climb up on a ladder, and add more birdseed, who was not a good person? This is the kind of person who, when you go to their house, hugs you and makes you feel completely welcome, and probably gives you something good to eat, and insists you come out back and look at all the birds that have come in to the feeders. You go along, even though you are in a hurry and are not that interested, and when you get out to the yard, your attention focuses more on this person, because of their enthusiasm and excitement for the wild birds, rather than on the birds themselves. Not only did Scotts Miracle-Gro sell wild bird feed tainted with bird-killing insecticides, they were also found guilty of submitting false documents to the EPA and state regulatory agencies to deceive the agencies into believing that numerous insecticides were registered with EPA, when they were not. Thank you, Scotts Miracle-Gro, for your commitment to your customers. We will not forget you."